The magnificent return of Lilith's second set of adoptive parents! Some of you might remember these two from the previous version of the comics. I did a little bit of a design change with these two, but nothing super drastic. I changed Etzy's skin color so it's less saturated yellow and a more normal-pinkish color and gave her hair a darker tint towards the tips. For Lex... I think I just tried to make him look older, I didn't really change much else. Also I've changed the font I use to one that's easier to read (it's still based off my handwriting though). I've also updated all the prior pages with the new font so the font doesn't just change randomly on page 4. I spent a lot of time on it trying to make it look decent and readable and I'm pretty darn happy with the outcome so I hope you all like it too. I'm also deeply considering revamping the cast page. I've developed a fondness for headshot silhouettes that turn into colored headshots when the character appears so I might try to do something like that and link to a small blurb about the character. For each new story arc I'd add a new clump of silhouette heads and as the characters show up I'd reveal the headshot and small blurb. What do you think? Mmm, I think that's about it for this page. I promise next week I'll talk about the pictures in the frames all over their house since they show up a lot more on the next page. Or, here's a suggestion, Lilith. Braids. Darn stubborn teenagers, making everything complicated! He always looks like that when he first wakes up. It's canon. Lex is not a morning person. He looks just like me. Aside from eye/hair color, that is. Even hair length, death-like voice and pajamas are similar. ... I was just going to ask why she doesn't cut it. Now I know. Her parents want her to. Yes there's that. She also has some (silly) personal reasons for keeping it so long. But she's the one that has to suffer through washing and brushing and taking care of it, so she has no one to blame but herself! The hair is awesome, I wouldn't want to cut it either, haha. It is so very awesome. She does tie it up in different ways though so it's not constantly dragging on the floor and getting caught in doors. Depends what she's doing. she's so small now! 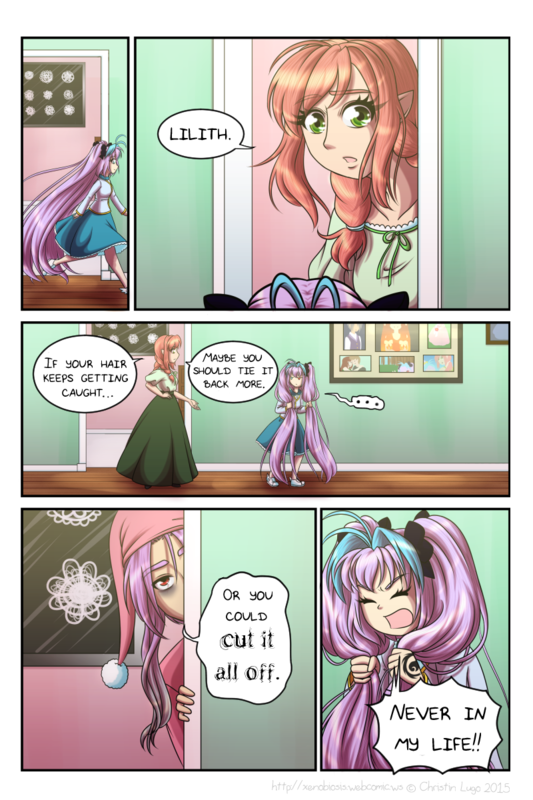 keep your hair small lilith! So small and tiny and cute. Click link and look to the bottom left panel for an adorably excecuted "neverrrrr". I second the notion to cut her hair! She'd look about the same as she does now just without the ponytails. The story flow is so good too, I'm completely sucked in. I'm not really in a position to judge Lilith. Every kid in my family has gone through the long hair stage. However, only one has achieved the foot-wide white man's afro. We're kind of jealous. The character profile idea sounds great, it sure solves the problem of critical characters being known about way ahead of time. Oh man I'm jealous too, that sounds like quite the accomplishment. Yeah, that's another reason to make the cast page like that. Another is the headshots will do a better job of displaying the character than what I've currently got on that page. I'll probably start making the busts this week after I get some more work done on pages. I like Peeking Around the Door Guy already. Yeah, he's great, I can't wait to show him more often. How dare such suggestions be made in this house?! I won't stand for it! You tell him, Lilith! Getting all your hair chopped off is traumatic as hell! Heck yeah it is, especially when it's really long or you've been trying to grow it out. MY HAIR HAS FEELINGS TOO YOU KNOW! Every single hair has feelings, why can't you understand that? I see nothing wrong with cutting it all off. So stubborn :D Loving the art in these pages though, keep up the great work! Don't say such terrible things. We don't speak of such things in this house!